Junior goalie Jake Oettinger stopped all thirteen shots he faced during the first two periods and seven different Terriers tallied goals as BU dominated Acadia University in last night's exhibition opener at Agganis, by a score of 7-1. The Terriers got on the board two minutes into the game on an unassisted shorthanded tally by freshman Matthew Quercia. The Andover, Massachusetts native skated out of the BU zone and cleared the puck down the ice; but the Axeman goalie Logan Flodell was unable to handle the bouncing shot and BU got off to a 1-0 lead. Red shirt junior Shane Switzer doubled the lead two minutes later when senior Ryan Cloonan found the Bloomfield Hills, Michigan native in the left circle. Switzer wristed a laser past Flodell for a 2-0 BU lead. It took the Terriers only 95 seconds into the second period to resume the romp. Parkland, Florida freshman Mark Cheremeta found Max Willman with a sharp cross-ice pass deep in the Acadia zone and the graduate transfer student backhanded the puck past Flodell for a 3-0 BU lead. Less than a minute later sophomore Logan Cockerill skated down the wing into the Acadia zone, found freshman Jake Wise. The Reading, Massachusetts native's wrister was initially stopped by Flodell but junior Patrick Curry rapped the puck home for a 4-0 BU lead. BU's fifth goal came halfway through the middle stanza as a result of an overly aggressive Acadia backcheck at the point. Junior Dante Fabbro, who led all skaters with a +4 plus/minus rating, skated in a few strides from the blue line, fired a wrist shot on net and freshman Jake Wise took advantage of his open space to put the rebound into the Acadia net for a 5-0 Terrier lead. Having a comfortable margin going into the third period, Coach Albie O'Connell gave Oettinger the rest of the night off. Redshirt junior Max Prawdzik was brought in for the majority of the third period. Less than a minute into the final stanza, sophomore defenseman Kasper Kotkansalo made a beautiful breakout pass from deep within the BU end to freshman Joel Farabee who put a one-handed shot on net. Junior Patrick Harper managed to poke home the rebound and gave the Terriers a 6-0 lead. Less than eight minutes later, while BU was down a man, Farabee would tally his first collegiate goal on a missile of a wrist shot from the right circle. 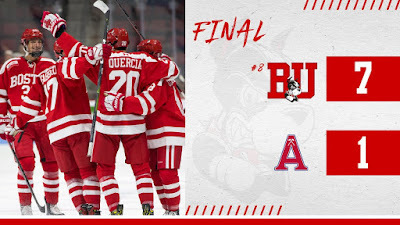 Acadia deprived BU of a shut-out by scoring a power play goal with one second left on a Hugo Blixt slashing penalty. Junior Nico Lynch came in for the last three minutes and saved the only shot that was taken against him. The Terriers will travel to Mankato, Minnesota next week for a season opening two-game series against 10th ranked Minnesota State University on Friday and Saturday night. Last October BU was swept at home by the Mavericks. 2019 recruits Trevor Zegras and Alex Vlasic each scored a goal as the NTDP U18s defeated Notre Dame, 4-1, for its first win against an NCAA team this season. In USHL action, two 2020 Terrier recruits put in strong performances but the NTDP U17's lost in an overtime shootout to the Madison Capitols on Saturday evening. 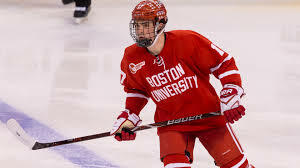 Boston native Drew Commesso stopped 42 of 43 shots in 65 minutes of play and Roseville, California native Dylan Peterson scored the lone goal for his team. Former Terrier and leading scorer on the 2009 BU National Championship team, Colin Wilson scored two goals as the Colorado Avalanche defeated the Philadelphia Flyers. The Terriers bounced back after getting shut-out by Northeastern and skated to a 3-3 tie with the Huskies at Walter Brown Arena on Saturday afternoon. 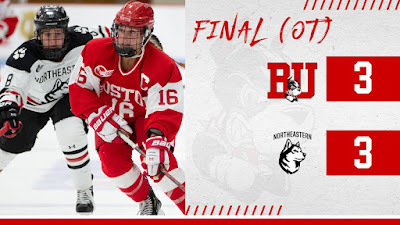 Redshirt junior Sammy Davis, who missed the 2017-2018 season with an injury, scored on a backhander from the slot that put BU ahead 2-1 in the first period but two Husky goals in the second stanza evened the score at three apiece and that's how the contest ended. Terrier sophomore netminder Corinne Schroeder made 35 saves and sophomore forwards Jesse Compher and Nara Elia tallied the other Terrier goals. BU travels to Merrimack next Friday to play the Warriors in a 7:00 match-up.